Together the carbonate-silicate and organic long-term subcycles play the dominant role in controlling the levels of atmospheric CO2 and O2 over millions to billions of years. In this book I show how these subcycles have operated only over the past 550 million years, the Phanerozoic eon. The Phanerozoic is chosen because of the abundance of critical data such as abundant multicellular body fossils, relatively noncontroversial pa-leogeographic reconstructions, and relatively agreed-upon tectonic and climatic histories. Such a situation is not available for the Precambrian. The plethora of Phanerozoic geological, biological, and climatic data are extremely useful in trying to recreate the history of the carbon cycle. This will be done in the present book. The reader is referred to the books by Holland (1978, 1984) for discussion of the carbon cycle before the Phanerozoic. 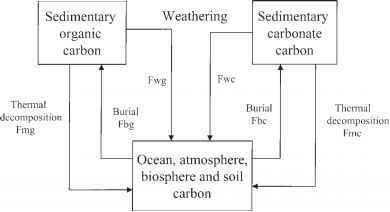 Fwg = carbon flux from weathering of sedimentary organic matter Fmc = degassing flux from volcanism, metamorphism, and diagenesis of carbonates Fmg = degassing flux from volcanism, metamorphism and diagenesis of organic matter Fbc = burial flux of carbonate-C in sediments Fbg = burial flux of organic-C in sediments. + 8mgFmg 8bcFbc 8bgFbg where 8 = [(13C/12C) / (13C/12C)stnd - 1] 1000. and stnd represents a reference standard. Equations (1.10) and (1.11), when combined with assumptions about weathering, burial and degassing, can be used to calculate the various carbon fluxes as a function of time. More complicated expressions have been used for carbon mass balance in some models where the surficial system is broken up into its parts and separate mass balance expression are used for carbon in the atmosphere, biosphere, and ocean. 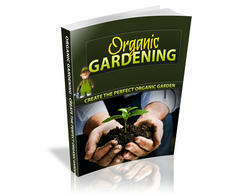 However, the simpler approach of equations (1.10) and (1.11) will be emphasized in the present book. By lumping the atmosphere, oceans, life and soils together, processes involved in the short-term carbon cycle are avoided in the modeling, and the use of steady-state becomes possible. A diagrammatic presentation of this approach is shown in figure 1.3. Figure 1.3. Modeling diagram for the long-term carbon cycle. Fwc = carbon flux from weathering of Ca and Mg carbonates; Fwg = carbon flux from weathering of sedimentary organic matter; Fmc = degassing flux from volcanism, metamorphism, and diagenesis of carbonates; Fmg = degassing flux from volcanism, metamorphism, and diagenesis of organic matter; Fbc = burial flux of carbonate-C in sediments; Fbg = burial flux or organic-C in sediments. This greatly simplifies theoretical modeling of the long-term carbon cycle. It means that the sum of input fluxes to the surficial system are essentially equal to the sum of all output fluxes. For each million-year time step, although input and output fluxes of carbon to the surficial system may change, they quickly readjust during the time step to a new steady state, This is known as the quasistatic approximation. Non-steady-state modeling (Sundquist, 1991) has shown that perturbations from surficial system steady state, for the long-term carbon cycle, cannot persist for more than about 500,000 years. Fbc - Fwc represents the carbonate that is formed only from the weathering of Ca and Mg silicates, as opposed to that formed from both Ca and Mg silicate and carbonate weathering (Fbc). Equation (1.13) illustrates the necessity of knowing the rate of carbonate weathering (Fwc) in calculating the rate of silicate weathering. In GEOCARB (Berner, 1991, 1994; Berner and Kothavala, 2001) and similar modeling (e.g., Kump and Arthur, 1997; Tajika, 1998; Wallmann, 2001) the weathering and degassing fluxes, Fwc, Fwg, Fmc, Fmg are expanded in terms of nondimensional parameters representing how a variety of processes affect rates of weathering and degassing. The parameters are multiplied by present fluxes to obtain ancient fluxes. These non-dimensional parameters are discussed in the next three chapters and provide a window into the inner workings of the long-term Phanerozoic carbon cycle. 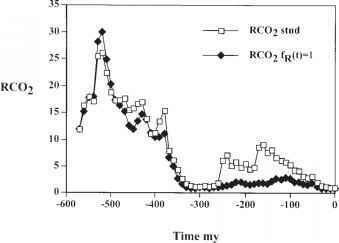 The last two chapters show how calculations based on long-term carbon cycle modeling can be used to estimate the Phan-erozoic evolution of atmospheric CO2 and O2. The modeling results are then compared to independent estimates of paleo-CO2 and O2 to give some idea of the accuracy and deficiencies of the modeling.